Blog » Heywood-Wakefield: Looking Forward » Want us to match the color of your non-Heywood-Wakefield furniture? Home » Blog » Heywood-Wakefield: Looking Forward » Want us to match the color of your non-Heywood-Wakefield furniture? Want us to match the color of your non-Heywood-Wakefield furniture? Send us a sample of the color you want, and we’ll use advanced technology to match it. Send us the stain itself, a small piece of material with the stain applied, or a small component (such as a shelf or drawer front) from the furniture you want matched; we’ll return it promptly in perfect condition. Please note that pictures of the color, whether on paper or sent digitally, do not provide an accurate enough representation of the true hue. Also, stain doesn’t affect the grain of wood. Our Northern Yellow Birch will retain its distinct look. The color will match, but that doesn’t mean the furniture pieces will look exactly the same. We prepare our color-matched stain, apply it to a small piece of our birch lumber, and send it to you. Once we get your approval, we’ll proceed with your order. A small fee will be charged to cover our time and costs. Often, it’s even easier for us to refrain from staining your item and ship it to a local professional furniture finisher of your choosing. This may be more convenient for those wanting to match their new furniture to pieces they already own. It’s important to note that furniture finish isn’t just about the look; it also protects the wood. Your unstained furniture must be handled with care, stored properly, and finished quickly. A reputable furniture finisher knows all this, so be diligent in choosing a qualified professional. We’re sometimes asked why we don’t offer the Champagne and Wheat finishes applied to vintage Heywood-Wakefield pieces, and whether we can do so by special request. Usually, these questions come from people who want to purchase new pieces to match vintage ones in their homes. We would if we could, but unfortunately, it’s just not possible. Vintage Heywood-Wakefield furniture has been in use for 60 or 70 years. All furniture finish changes in appearance over time. Many environmental factors (e.g., exposure to sunlight, heat, humidity, and smoke) affect how it changes. No two vintage pieces have led the same lives through the decades, so no two look exactly the same today. So there’s no way for us to make stains today that match the many current looks of these former Heywood-Wakefield finishes. 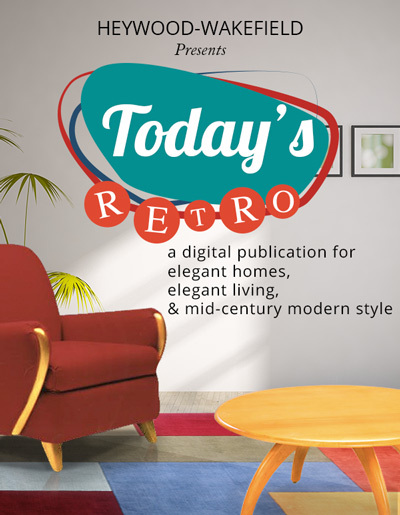 Love the mid-century modern era? Then subscribe to get some of our original content celebrating the times in a monthly email! Leonard Riforgiato is a successful furniture manufacturing entrepreneur, a Miami resident, and co-owner of legacy furniture company Heywood-Wakefield.